TidalWave MSD | Products | Headhunter Inc. Tidal Wave aerobic biological sewage treatment systems are U.S. Coast Guard certified Type II Marine Sanitation Devices (MSD) in accordance with 33CFR Part 159. These systems are recommended for US Flagged vessels over 65 feet long. Standard models are available to treat 50 to 10,000 US gallons per day (0.2 to 38 cubic meters per day). 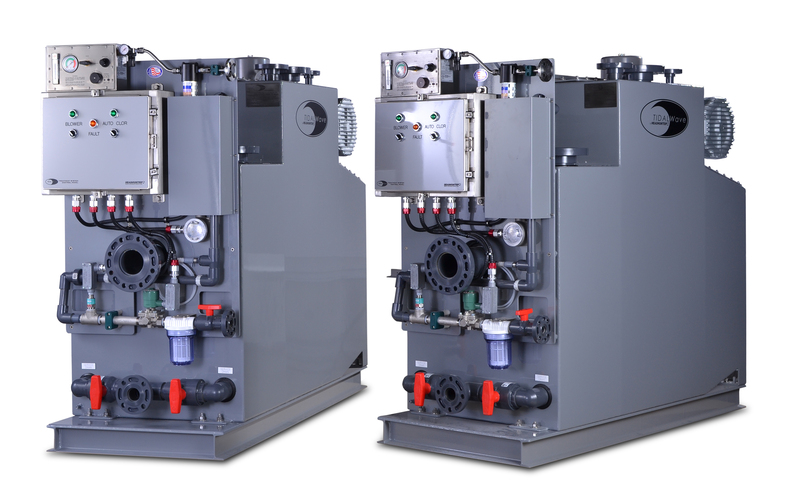 These systems have no moving parts in the treatment chambers that contact sewage. The biological process is simple, reliable, and efficient. The system makes good environmental sense by working with nature to accelerate the normal biological process. With the addition of oxygen, natural occurring bacteria digest solids and a mild disinfectant is added to kill harmful pathogens. The aerobic process ensures reliable odor free operation. 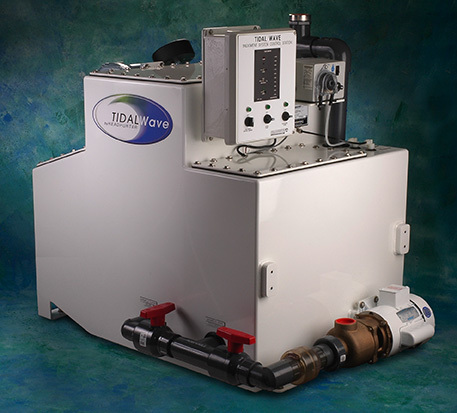 All Tidal Wave systems are available constructed with either 3/16 inch A36 steel or 1/4 inch marine grade aluminum, coated with high solids filled epoxy for superior corrosion protection. Custom designs are available to conform to your specific space configuration. Each treatment system includes a blower, a chemical injection pump, and a polyethylene chlorine solution storage tank. Options include electrical a control panel, tablet feeder, treated effluent discharge pump, or sewage transfer pump. See the following pages for application guidance.